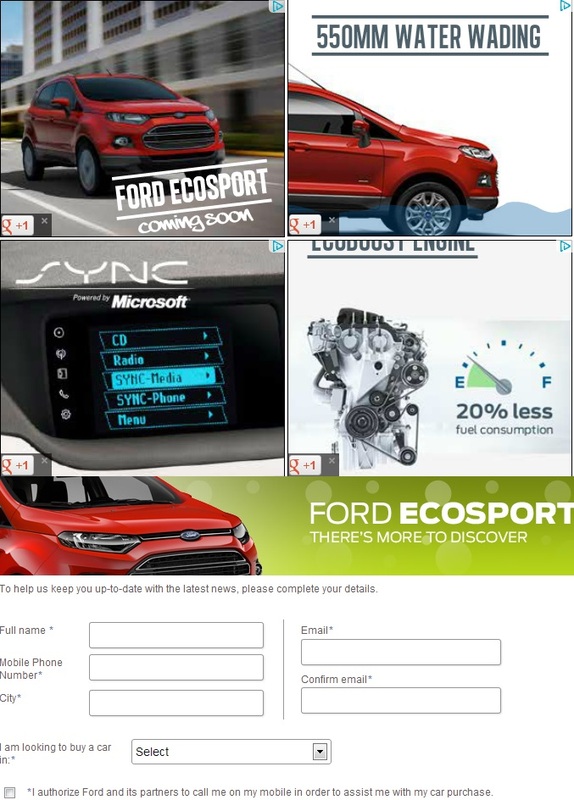 Ford India has started an online ad campaign which says, "EcoSport, coming soon". Features highlighted include the EcoBoost engine’s 20% less fuel efficiency, SYNC, and 550 mm water wading ability. The Ford India is recent media drive at Goa confirmed that there would be three engine transmission and 4 variants. The 1.5L Diesel engine, and ofcourse the volume garner for Ford India will come only in Manual transmission. The engine will deliver a power of 89 bhp and 204 N-m of torque. The car will come equipped with ARAI acclaimed fuel efficiency of 22.7 Kmpl. The 1.5L Gasoline engine will be available in both 5 speed manual transmission and 6 speed automatic transmission. The engine will deliver 110bhp of power and 140 N-m of torque. The manual variant will come with ARAI acclaimed fuel efficiency figures of 15.8 Kmpl and 15.6 Kmpl for automatic variant. The most awaited 1.0L EcoBoost Gasoline engine, which will be available only on Titanium and Titanium Optional variants will come with 5 speed manual transmission and will deliver power of 122.5 bhp and 170 N-m of torque. The engine comes with ARAI acclaimed fuel efficiency figure of 18.9 Kmpl. EcoSport bookings will open soon at outlet near you. Stay tuned for more ! Read more about Ford EcoSport here. Is this the front of the new Pulsar 375 !